If you love dinosaurs, Denver is the place to be. The city lies on some of the most fossil-rich land in the world, which means finding a piece of prehistoric history is as easy as walking your dog. Just ask a guy in Littleton—that’s how he found parts of a T. rex. Here’s a look at the Denver area’s dinosaurs. 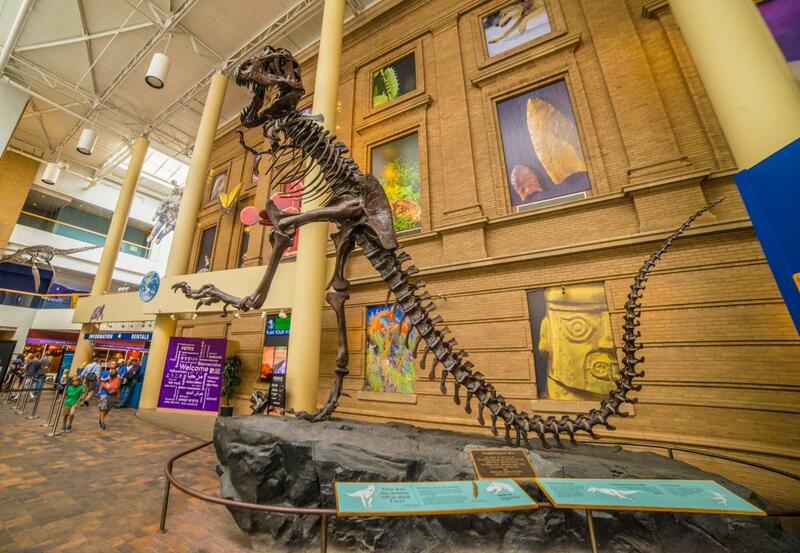 One of the best places in Denver to find dinosaurs is the Denver Museum of Nature & Science, one of the premier natural history museums in the country. The Museum has close to 115,000 dinosaur, plant, and mammal fossils in its collections. You can visit the award winning Prehistoric Journey exhibition, which features a Stegosaurus fossil discovered near Cañon City by a high school teacher, and an Allosaurus skeleton found by a 13-year-old girl in Moffat County. Dinosaur Ridge is a famous natural landmark, located along the Front Range of the Rocky Mountains, near Morrison, Colo. It features famous Jurassic dinosaur bones, such as Stegosaurus and Apatosaurus, discovered in 1877, and Cretaceous dinosaur footprints. A guidebook is available for use on self-guided tours. Guided tours can be arranged through the Friends of Dinosaur Ridge. Dinosaur Discovery Days are free outdoor events open to the public. They are held monthly (May through October) at Dinosaur Ridge on either the second or third Saturday of the month. Guides are stationed along the Dinosaur Ridge Trail at the most significant interpretive sites. Visitors hike at their own pace or take the Shuttle Bus (one way) at $4 per person (3 and under ride free). At the Visitor Center, Hands-on Dinos for kids includes the Backyard Bones Dinosaur Dig, the Cretaceous Crossroads Dinosaur Track Site, the Grallator Track Painting (paint a fossil and take it home), puppet shows performed by the Deep Time Players, and other activities depending on the theme for the day. The indoor exhibit, Trek Through Time, has free admission all day. The shuttle buses operate continuously between the East Gate and the Dinosaur Bone Site (see map of locations) during the event. The Shuttle Bus Tour resumes its normal schedule between the Visitor Center and the Dinosaur Bone Site after 3 p.m. Stand exactly where a dinosaur stood 68 million years before you! This half-mile hiking trail is full of trace fossils, which are the footprints and marks made by animals walking or crawling. To get to the trail, park in the lot west of the Ford dealership on 19th Street, just east of U.S. Highway 6 in Golden, then take the bike path west and follow the trail south about a quarter mile. A picture perfect setting with flawless all-natural acoustics, Red Rocks Park & Amphitheatre is a Colorado original. While it may be known first and foremost a music venue, Red Rocks also has a prehistoric connection. In 1877, Stegosaurus, the Colorado state fossil, was found near Morrison, Colorado, which is the home of Red Rocks, while nearby dinosaur tracks also tell of the Jurassic Period. Also, fossil fragments of the giant 40-foot plesiosaur, the marine reptile mossaur, and flying reptiles captivate both students and scientists. Red Rocks Amphitheatre is located in the 816 acre Red Rocks Park, which is open to visitors daily from 5 a.m. to 11 p.m. On event days, tourists can visit the park until 5 p.m. Owned by the City of Golden, Fossil Trace Golf Club is not only a great place to get in a challenging round, but also a unique way to spot prehistoric history. Triceratops footprints as well as other fossils can be seen adjacent to the 12th green. Also, inside the main doors of the clubhouse, there is an exhibit that gives information about the tracks and fossils uncovered on the site. For the non-golfing crowd, the footprints can be accessed at the corner of 6th Avenue and 19th Street. There&apos;s a story behind everything-including the mascot for the Colorado Rockies. In 1994, construction crews turned up an unidentifiable rib fragment of a dinosaur near home plate during excavation for Coors Field. The discovery led to the invention of the world&apos;s second purple dinosaur, Dinger, the beloved mascot for the Rockies. On the Denver Trolley, enjoy a trip back in time-one that could be further than you expected. Lakewood Gulch, which is part of the Platte Valley Trolley route, is also home to the site of the first Triceratops fossil ever found. In 1887 it was misidentified as an extinct bison, but it was later discovered to be the horns of one of the world&apos;s most popular dinosaurs. The trolley runs Friday, Saturday, and Sunday from early spring to around Oct. 31. Tickets are $3 for adults and $2 for children. Pickup is right next to the REI Flagship Store. How about a cold one (or three)? And while you&apos;re enjoying those frosty beverages take a look out the window of Coors Brewery and you&apos;ll see the spot where parts of a Triceratops skeleton were excavated on North Table Mountain. Coors provides self guided tours for guests 21+ with a valid ID. Get a glimpse of early dinosaur discoveries from Colorado, including fossils from the first Stegosaurus and Apatosaurus ever found. 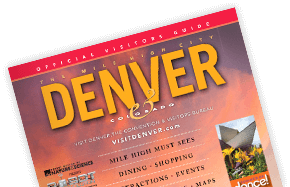 Located 25 minutes west of Downtown Denver, the 3,000-square-foot exhibition offers a relaxed environment that is perfect for kids of all ages to explore rocks and fossils. The exhibits and guides connect visitors with the ancient story of the Front Range. Recent local excavations have yielded famous baby dinosaur footprints that were featured in Smithsonian magazine and media outlets around the world. The CU Museum of Natural History is just another way the state embraces its fossil-rich land. This museum boasts a collection of about 95,000 cataloged fossil specimens gathered from around the world. Visitors can check out the paleontology hall as well as the exhibit, Fossils: Clues to the Past, which features fossils from the Rocky Mountain Region. The museum is open seven days a week, but closed on major university holidays. Admission is free, and donations are accepted.